This form will help you meet the requirements of Section 721.2(B) of the Official Compilation of Codes, Rules, and Regulations of the State of New York. 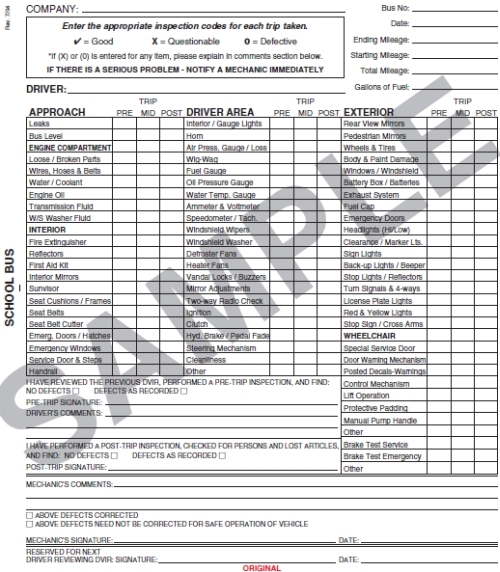 Includes inspection items with pre-, mid-, and post-trip categories, mileage reporting, and signature areas for the driver and mechanic. 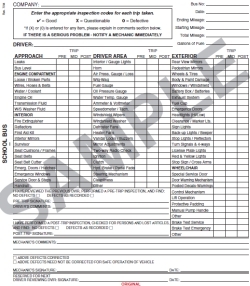 Form includes check-off boxes for pedestrian mirrors, emergency doors, stop sign/cross arms, and more. Two sizes available. Both sizes are carbonless book format with 31 sets of 2-ply forms per book. Make sure your drivers have the supplies they need - order today!